Dunstable Town gave themselves a huge chance of remaining in the Southern League Premier Division after beating Biggleswade Town 2-0 on Tuesday evening. 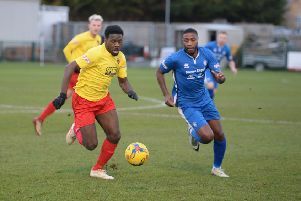 The Blues, who went into the game at the bottom of the league, after Gosport Borough hammered Frome Town on Saturday, were triumphant for the first time since January 23. Tony McCool’s side made it two clean sheets in a row and four points out of six following their 0-0 draw against St Ives Town at the weekend. Up against a Biggleswade side with little to play for, the visitors took the lead on 13 minutes through Ethan Lamptey. They then doubled their advantage in the second half as Daniel Trif scored after 67 minutes to give Blues breathing space. After the game, a thrilled manager Tony McCool tweeted: “I am so proud of the players tonight! Such emotion as well. “Lanre in the post match talk after his ACL confirmed & Daniel Trif scoring left me speechless with what he has been going through. “Massive credit to @Biggleswade1874 another game we had to work so hard in. Waders boss Chris Nunn was also generous in defeat, as he tweeted: “Awful performance, no hiding place for the boys tonight. The result saw Dunstable climb off the bottom, leapfrogging Gosport as they are three points above their rivals. The two sides are meeting Creasey Park tonight as Blues then finish their campaign at 13th placed Frome Town on Saturday, while Gosport head to St Neots Town, who are a place higher in 12th. McCool added: “It’s in our hands to do that and we can control it still so we have to focus on that. “After everything they have been through, they certainly don’t need motivating.